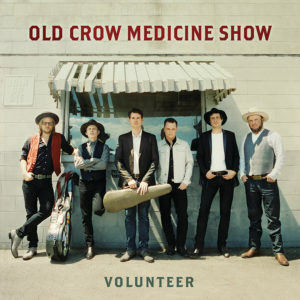 Old Crow Medicine Show – Volunteer Album Review: The roots band return for their 20th anniversary with Dave Cobb at the controls! After the roaring success of their 50 Years of Blonde on Blonde show, a tribute to the Bob Dylan record of the same name, at the Country Music Hall of Fame which subsequently turned into a live album and tour, Old Crow Medicine Show are back with a new collection of original songs. Volunteer is released in a year in which the band celebrate their 20th anniversary but still remain as relevant as ever. With Dave Cobb on production duties, this studio follow up to the Grammy-award winning Remedy, finds the band at the top of their game. The album kicks off with the single Flicker & Shine, which is in the typically rambunctious style that we come to associate with Old Crow Medicine Show. Following on from the Blonde on Blonde shows, this song proves that the band haven’t lost any of their foot-stomping and rootsy sound! It’s songs like this that make an OCMS concert such a high-energy and fun occasion! Lyrically, it’s all about brotherhood and standing together, much like this band has done for the last 20 years. A World Away kicks off with Ketch Secor’s harmonica and a laid-back feel. It’s a jaunty track about being stuck on the outside and wanting to be included, whether it’s a concert, a potential relationship or being a refugee, the latter being something that Secor has written about a lot in his lifetime. The music is so rich thanks to the roots instruments that weave throughout the song. Next up is Child of the Mississippi which has a bluesy-Deep South feel to it. The slide guitar trades licks with Ketch Secor’s vocals as he pays tribute to the blues artists who influenced him as he was raised in the Southern States. “I was raised on a river, muddy water gonna carry me home” is a nice nod to the legendary blues musician. The band show off there fantastic harmonies on this song to great effect. Track four is Dixie Avenue, is a somewhat autobiographical tribute to the place where Secor fell in love with music. It’s a fun and whimsical look at the place and music and is a lot more electric guitar heavy than many of OCMS’s songs. It’s definitely one that should get people up and dancing! It’s no secret that Bob Dylan has been a huge influence on Ketch Secor and the band as a whole, Look Away has this running through it. It also has a strong Rolling Stones and The Band vibe running throughout it. It’s another sepia-toned look back at the history of the South and the vocals really convey the emotion and love that Secor feels for his home. The fiddle is beautifully played over the instrumental section and shows off the sheer talent of the band. Shout Mountain Music is another real foot-stomper that should get people up and dancing at live shows. The giddy fiddle playing and calls of “woo” from the band during the chorus make for a superb classic bluegrass song that showcases what this band do best. Track seven, The Good Stuff, has an early 1900’s throwback feel to it. The thumbing double bass guitar and double-time rhythm feels like it could fit in a Prohibition-era film. It’s also an opportunity for Ketch Secor to step away from the mic and let one of the rest of the band step forward to sing, something that OCMS do often and to great effect. Things slow down a little on Old Hickory. It’s another historical song, this time about Major General Andrew Jackson, the man who rushed to save New Orleans from the British in the Battle of New Orleans. It’s another nod to Secor’s love for southern history. Homecoming Party is up next and slows things down considerably. It’s an autobiographical song about coming off tour and returning to your family. It’s a bittersweet song about the sadness of coming home to a family that have missed you but how you’re “ragged to the bone” and coming home “ain’t no homecoming party”. This song definitely seems to be deeply reflective and quite sad. The penultimate song on the album is the instrumental Elzicks Farewell. It’s a great opportunity for the band to show off their musical talents in a rowdy and foot-stomping manner. The dueling fiddles are played at lightening speed and help to create a song that is a fine example of mountain music! The album is rounded off with Whirlwind. This song is another laid back and reflective song that acts as a perfect tune to pay a tribute to the 20th anniversary of Old Crow Medicine Show. The song is beautifully accompanied by a haunting pedal steel guitar. It’s a beautiful way to finish off the record. Volunteer represents a strong return from Old Crow Medicine Show following their Blonde on Blonde tribute. The Grammy-winning success of their last studio album, Remedy, always meant that this would be a difficult release but they have done a great job of showing what they do best. With a forward-thinking producer like Dave Cobb at the helm, the band have continued to prove that they can make traditional music that still remains relevant and exciting today. Secor’s nous for reflective songwriting is on show and is never more effective than on songs such as Whirlwind and Dixie Avenue. The album doesn’t really possess a ‘radio friendly’ single such as Wagon Wheel or Sweet Amarillo but that’s not really what OCMS are all about. At the heart of it this is just damn good roots music. Brothers Osborne – Port Saint Joe Album Review: The Brothers are back with another eclectic mix that does not disappoint!